You know Babbel, don’t you? Shame on you if you don’t! :) In the blog to Learn English Online we have talked about Babbel a couple of times already, the first one as a formal introduction and the second one to mention that Babbel is not only good to improve your vocabulary but it also allows you to chat, do exercises or different tutorials with grammar content. We want to present you today another novelty that Babbel has recently incorporated and that’ll be very useful for any trip that you make. 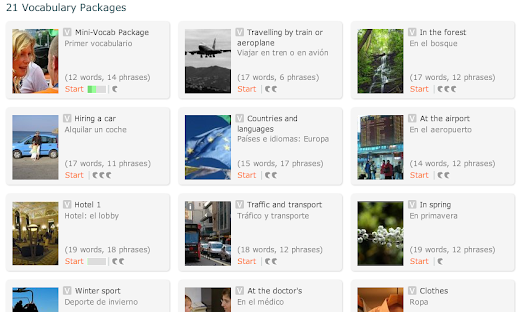 It’s a set of 21 new vocabulary modules related to travelling and holidays. This vocabulary includes words and sentences commonly used when travelling by train or airplane, hiring a car, at the airport, at the hotel, at the doctor, going on a beach holiday, looking for accommodation, camping, at the youth hostel, asking for directions or shopping. In one word, extremely useful vocabulary for everyone wishing to travel and wanting to do a quick review of their vocabulary. If you are travelling either for pleasure or business reasons, this complete pack of vocabulary comes in very handy. Babbel is a nice tool when learning English. However, for English speakers it can be a little bit "poor". Hardly ever I find in Internet tools for advanced English students. Could you recommend me any? You can have a look to our Learning Guides for advanced learners. Grammar: have a look at our Grammar resources. Vocabulary: Watch movies, videos, read books (all in English). In the blog we have mentioned different free resources where you can find all of the above. Listening: Again, watch movies, videos, listen to podcasts. Speaking: Go to any social network to learn languages and try to find an English speaker who with you can do a language exchange, get her/his Skype and practice at least a couple of hours every week. I need to practice my speaking. It's difficult to find English speakers in Spain, but social networks and Skype can be very useful. The lessons were actually developed by ACTFL (The American Council on the Teaching of Foreign Languages) which ensures their quality. @Deprisa: A year ago I found two great English speakers to do a language Exchange using the social network Soziety. I don’t know if it’s still useful. No worries about the help, if you need anything else just give me a shout. @Sarah: Thanks for the presentation about hello-hello. I didn’t know about it, but looks promising. Good stuff. I've seen your tips for jobs interviews and CV. Thank you very much :D I'm unemployed, so I found them very, very useful.